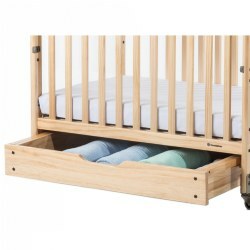 Kaplan offers cribs with wheels, drawers, adjustable bar heights for easy access, as well as foldable cribs that are perfect for traveling. 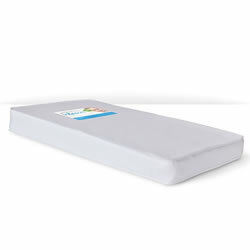 Children will stay comfortable with Kaplan's large collection of colorful and patterned regular and fitted sheets. 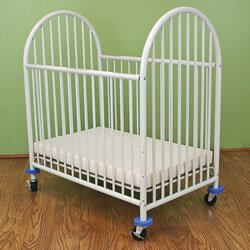 Kaplan also provides replacement mattresses, mobiles, crib rail wraps, and other crib toys to keep infants entertained. Attractive arched headboard design uses metal tubing for durability. Gloss-white powder-coat finish is easy to clean and scratch resistant. 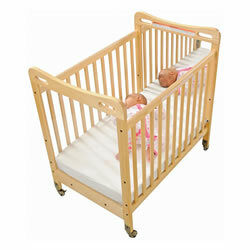 Three adjustable heights offer higher levels for easy access for infants. Comes with a 3" thick vinyl covered mattress with flame retardant foam. 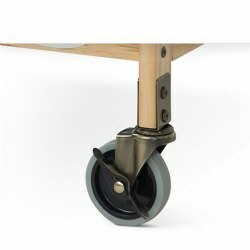 Features extra wide heavy duty swivel casters with two casters that lock for increased maneuverability. 44 1/2"H x 40"L x 25 1/2"D. Assembly required. 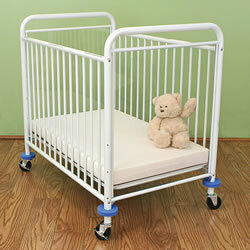 This metal commercial crib has dual clear-view acrylic windows and a sturdy reinforced metal frame. Steel cross bars span underneath the mattress for support and additional strength. Three inch heavy-duty, double-wide casters (2 locking) provide easy maneuverability in a fire drill. 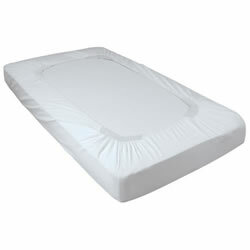 The included 3" mattress adjusts to 3 heights and is sized 3" x 24" x 38". 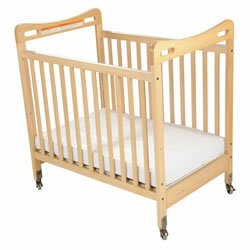 Crib measures: 39 3/4" x 25 1/2" x 40 1/2". Assembly required. 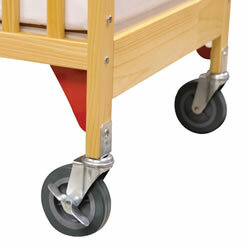 This kit makes it easy to convert your standard crib frame into a fire evacuation unit. 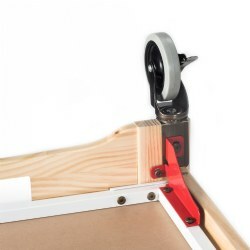 Kit includes 5" non-marring casters (2 locking) with extra threshold strength and 4 solid steel caster brackets that attach to the steel frame carriage of the crib. Assembly required. Lifetime warranty. 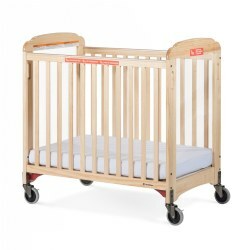 Compatible with cribs: #24929 Safe & Sound™ Fixed Side Clearview Crib, #24930 Safe & Sound™ Easyreach Compact Crib, and #25957 Safe & Sound™ Fixed Side Mirror Compact Crib (all sold separately). The SleepSack® wearable blanket replaces loose blankets in the crib that can cover baby's face and interfere with breathing. In addition to helping baby sleep safer, the SleepSack® wearable blanket helps baby sleep better, too. It is a warm cuddly blanket they cannot kick off; ensuring baby sleeps soundly throughout the night. Use over regular sleepwear to take the place of loose blankets. Inverted zipper for easy diaper changes. 100% cotton. Large size fits 22-28 lbs. Machine wash with like colors. The 4" deep wood drawer has heavy duty steel guides and provides additional storage. It is easy to attach and has a cut out handle. Assembly required. 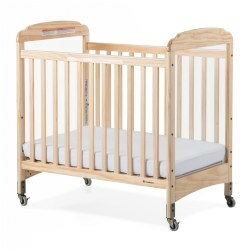 Compatible with cribs: #24929 Safe & Sound™ Fixed Side Clearview Crib, #24930 Safe & Sound™ Easyreach Compact Crib, and #25957 Safe & Sound™ Fixed Side Mirror Compact Crib (all sold separaetly). Crib blanket is high quality 100% cotton thermal. The coziest blanket for baby in a soft colors. Measures 30" x 40". Choose color. 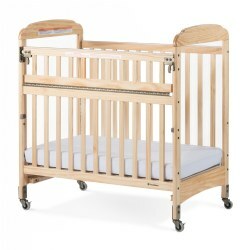 Evacuation frame with antique brass casters for natural cribs (fits next Generation Serenity Compact Cribs) Evacuation Kit includes evacuation protocol sign and evacuation icon to adhere to crib for rapid identification. 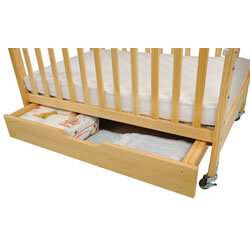 Add-on an EZ Store crib drawer with MaganSafe Latching System. 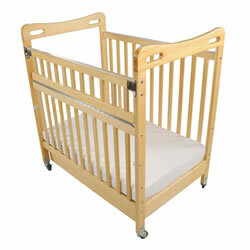 Fits Next Gen Serenity Compact Cribs. 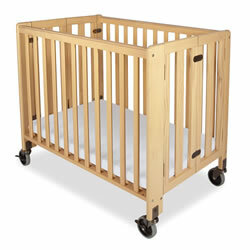 You can easily convert your SafetyCraft® wood crib into an evacuation crib with Evacuation Casters. Includes evacuation training materials for caregivers and evacuation icon for easy recognition by emergency personnel. 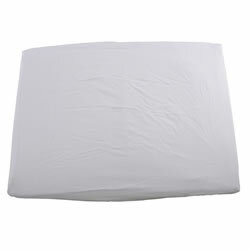 100% cotton jersey compact size fitted sheets are extra soft and have full elastic edges for a perfect fit. Available in blue, ecru, white, green or an assortment. 24" X 38". 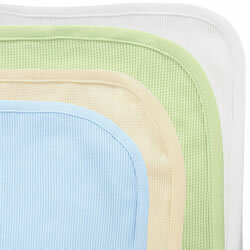 Crib blankets are high quality 100% cotton thermal. The coziest blanket for baby in a soft colors. Measures 30" x 40". Sets include 4 blankets of the same color. 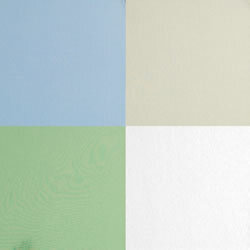 Assorted contains 1 each of: Blue, Ecru, Green, and White. Choose color. Birth & up. This Cellular Baby Blanket by lulujo makes the perfect swaddle, baby blanket, and nursing and stroller cover year round. 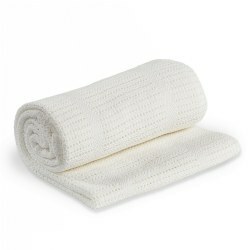 The soft cotton texture is soothing on the skin and the cell construction makes the blanket breathable and light. Made from 100% cotton. Machine washable. Size: 39" x 31". This fitted crib sheet is 35% cotton and 65% polyester. 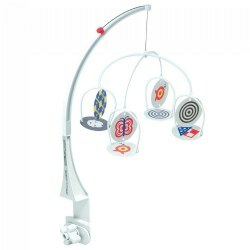 Fits the Super Crib Yard (70349).